When you think of Alaska, you might picture whales or ice floes. But cocktails? Not so much. Let’s change that. Because the Alaska Cocktail is perfect for transitioning into the cooler weather we’ll be seeing soon in the Northern Hemisphere. Drink it before dinner, and it lightens up heavier autumn fare. Sip it at the last summer cookout, and it will console as you put the Weber away for winter. As with so many cocktails, the origins of the Alaska are obscure. It dates back to the early 20th century at least, and originally may have contained Old Tom gin — a brand of sweetened gin that used to be very popular. These days, the Alaska is always made with dry (London) gin. Yellow chartreuse and a dash of orange bitters complete the recipe. BTW, if you can’t find yellow Chartreuse, the green variety will work too–just use a bit less (the green is stronger). But yellow has a better flavor in this cocktail, IMO. When mixing this drink, the biggest challenge is getting the ratio just right. Too much Chartreuse, and its floral flavor overwhelms the drink. Too little, and it disappears into the gin. Some early recipes called for a 2:1 ratio of gin to Chartreuse. Way too heavy for my taste! I’ve settled on a 3:1 ratio. But sometimes I make it 4:1, and find that pleasing too (if substituting green Chartreuse, I definitely recommend the 4:1 ratio). This recipe takes several minutes to make, and serves one. Fill a cocktail shaker or mixing glass half full with ice. Add all ingredients except garnish. With a long-handled spoon, stir until the liquid is icy cold. 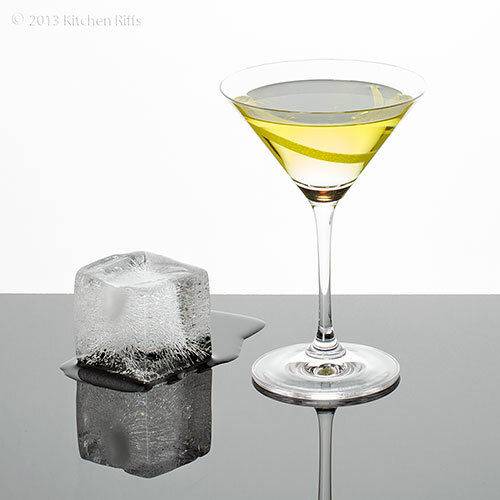 Strain into a cocktail glass (preferably one that’s been chilled). Add a twist of lemon for garnish, if desired, and serve. Why stir this drink rather than shake? Because the ingredients are clear, and you want the drink itself to stay as clear as possible. If you shake, you’ll introduce oxygen into the drink, which creates air bubbles that make the drink look a bit cloudy. 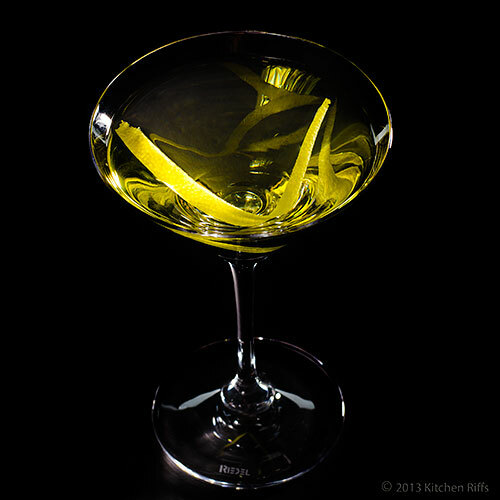 When a cocktail recipe specifies gin, it’s usually understood these days to mean London dry gin—which is also the type most commonly found in liquor stores. Any good name-brand dry gin will work well in this drink. In addition to London dry, you might see Dutch or Belgian gin (sometimes called jenever or genever), which is made from malt rather than grain. There’s also Old Tom Gin, which (as noted above) has a sweeter taste. Both of these varieties are harder to find than London dry. Carthusian monks began making Chartreuse during the 1740s in the town of Voiron (close to Grenoble and the French Alps in southeastern France). Production hasn’t been continuous, though. The brothers were expelled from France in 1793 and again in 1903. They produced Chartreuse in Spain from 1903 to 1927, when they regained possession of their distillery in Voiron. 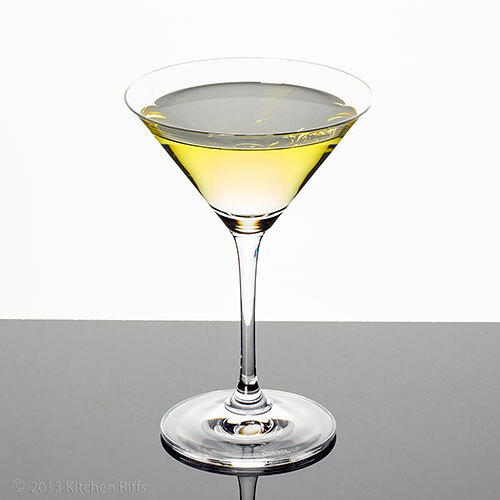 Chartreuse is sweet, with strong herbal flavoring (it’s made from a mix of 130 herbs, roots, and leaves). This liqueur is extremely pungent, so in cocktails a little goes a long way. Yellow Chartreuse is a bit milder, with less edge than the green variety. Most of the time, you shouldn’t substitute one for the other. But in this drink, you can get away with using either green or yellow, although yellow is the better choice IMO. 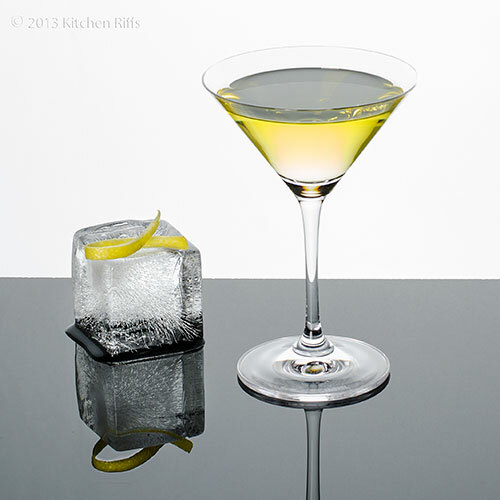 Speaking of green Chartreuse, we’ve used it in a couple of other cocktails: the Champs Élysées and the Last Word. My usual orange bitters is Regan’s Orange Bitters No. 6, but any brand will work in this drink. This summer we’ve been featuring a different warm weather-appropriate cocktail each week during our Summer Sippin’ Series. But all good things come to an end. We’ll soon be back to our normal schedule, which means just one post about cocktails each month—at least for a while. We began this year’s Summer Sippin’ Series right after Memorial Day, with The Bridal Cocktail. In June, we featured the Mimosa, the Dark and Stormy, the Caipirinha, and the Bacardi Cocktail. In July, we served up the Gin Rickey, the Royal Bermuda Yacht Club, the Harvey Wallbanger, the Cuba Libre, and the Maiden’s Prayer. Then in August we celebrated Tiki month, with a platter full of Tiki-themed drinks and food posts. We had a swell time lounging about and sipping the Volcano Bowl, the Scorpion, the Hula Hula, and the Blue Hawaii. And now we’re ending this year’s Summer Sippin’ Series with The Alaska Cocktail. But fret not. We have loads of fun food posts coming your way. And during the first week of October, we’ll sample yet another great cocktail. Now where should we store those Tiki torches? It's just barely spring.. we can still try one before summer, right? It's gorgeous! Hi Maureen, this is a great cocktail for the fall or spring - basically that time when seasons are changing between quite warm and chilly. Good any other time, of course, but particularly nice right now and for the next month or two, no matter where in the world you are! Thanks for the comment. Since that wild girls' night out (long story) I am not much of a gin drinker, but this beautiful cocktail just might convince me to give it another try. Just a stunning photo. I loved revisiting your summer cocktails. Good tip on shaking the drink making it look cloudy...I always wondered why some drinks were stirred instead of shaken! Looks yummy! Hi Karen, gin (and tequila) seem to be the two spirits that people tend to shun after long nights out! Both have a distinctive aroma that I think turns people off after that. Good news! The Chartreuse in this drink doesn't overpower the gin, but sure gives your nose something else to think about. ;-) Thanks for the kind words, and comment. Hi cquek, ;-) Thanks for the comment. Alaska sounds pretty good to me right about now, suffering through the sweltering Austin heat! Ah well, I can have the second best thing to sitting on an ice block up there... one of these gorgeous cocktails! Thanks for sharing, John. Hi Ashley, I sometimes just go ahead and shake drinks that should be stirred, but there really is a good reason to do one or the other in most cases. Thanks for the comment. Hi Georgia, even when Alaska is hot, it's cool compared to the heat in Austin! Just sip on one of these and you'll feel better. ;-) Thanks for the comment. I love this simple and gorgeous Alaska Cocktail! Must be so refreshing and delicious. The lemon twist is a must for me. I've never heard of this cocktail but it sounds delightful! Thanks for introducing me to something new! I really enjoy gin, so this sounds like a drink I would like! I'm ready for fall and the cooler weather. Hi Amy, I agree the lemon twist is a must! Thanks for the comment. Hi Kristi, we've been to Alaska once, too, and loved it too. Great state, great drink! Thanks for the comment. Hi Karen, so sad your time in Maine is coming to an end. :-( One of these will help cheer you up. ;-) Thanks for the kind words, and comment. Hi Katherine, it really is a fun and tasty drink - perfect before dinner. Thanks for the comment. Hi Amy, it's been hot here the last couple of weeks, so cool weather sure sounds inviting! Thanks for the comment. Hi Ray, a couple is a good number! Thanks for the comment. Hi Nee, sorry to see you packing your tent! But this is one of the best cocktails we've made all summer, so you stayed for the best. :-) Thanks for the comment. What a great cocktail to end the series on! My husband went to Alaska two years ago and fell in love with the landscape. I'll have to make this cocktail as a fun celebration of his trip! Thank you for sharing with me. I hope you are having a wonderful Wednesday! That is one stunning drink!! Gin is having such a renaissance now. I'm glad, too, because it's so perfect, especially at this time of year when the weather is warm. Hi Monet, your husband will love you for making this! Hope you get to see Alaska someday - the scenery is awesome. Thanks for the comment. Hi Alyssa, and it drinks better than it looks! Thanks for the comment. Hi Carolyn, I'll drink gin any time of the year, but I so agree it's primo when the weather is warm. Thanks for the comment. What gorgeous, professional looking cocktail pictures. Pinned! Your first picture looks like a painting to me. So beautiful! The Alaska cocktail really has caught my attention. I've always been a gin fan and just love how clear this drink is. So simply and so clean. Great drink! The ice cube and the name of this drink reminded me of camping by a glacier in Alaska, sitting back drinking gin and tonics using glacier ice. That ice was SO dense that I after three gin and tonics the original cube of ice was still a cube of ice! Hi Denise, glad you enjoyed it - thanks so much. Hi Charlie, it's a nice, clear drink - really pretty. Thanks for the comment. Hi MJ, isn't Alaska great? We've been only once, and I could definitely go again! Thanks for the comment. Good notes (as always). I want a giant ice cube mold. Nice cocktail John...I yet have to visit Alaska...I love the pictures. Hi Debra, those big ice cube molds are fun! Thanks for the comment. Hi Juliana, I hope you get a chance to go someday - it's gorgeous. Thanks for the comments. There nothing not to love about this cocktail, it's sunning. Your picture is just beautiful. Has to be in a magazine. What a lovely cocktail. Who knew there was one named after the state? Great post John! This cocktail looks absolutely delicious, Alaskan cocktail is awesome! An Alaskan cocktail? I guess the Tiki cocktail series is truly finished. This really is an attractive cocktail, John, and your post a great read. I always find your cocktail posts entertaining, even when the main ingredient is a liquor that I do not enjoy. Normally I would skip the post but not yours. Hi Kiran, nothing is too regal for you! ;-) And it is a pretty drink. Thanks for the comment. Hi Asha, it's really a lovely drink with super flavor. Thanks for your kind words, and comment. Hi Anne, isn't this great? And I'd love to know how/why it was named after Alaska. Thanks for the comment. Hi Uru, now that you're drinking age you might want to sample one! Thanks for the comment. Hi John, maybe the fire was the result of rioters protesting the end of the Tiki series? ;-) Thanks for the comment. Loved the 3rd picture...was starring at it for few minutes. Very sleek looking cocktail!! I've never sampled a cocktail using chartreuse, so this is one I'd like to try! Hi Shibi, that third picture has a lot of interesting reflections, doesn't it? Thanks for the comment. Hi Liz, Chartreuse is pretty good stuff. But a tad expensive, alas - but then so many good things are, aren't they? Thanks for the comment. I hadn't heard of an Alaska - you're always teaching me something! I loved the history about chartreuse, and how it was originally made by monks. Hi Beth, I doubt if most people have heard of this cocktail, but it's one that's well worth drinking - it's quite good. Thanks for the comment. Hi Barb, the problem with Chartreuse is it does have limited uses. But this cocktail is a good one, and worth buying for it alone (the Last Word is also extremely good). Assuming you're cool with that. ;-) Thanks for the comment. What a beautiful drink! Love that ice cube with a twist of lemon on the first photo. I love the photos. I haven't heard of this cocktail before and I guess I haven't heard of Charteuse either. Hi Julia, isn't it pretty? I had a lot of fun with that ice cube! Thanks for the comment. Hi Dawn, it's a great cocktail, although one that's not well known at all. Thanks for the comment. such a beautiful cocktail to end the summer sippin series. I so love the picture of ice cube on the side. im in the philippines right now, so the site of this cocktail punctuated by gin is what i need. Hi Kumar, orange bitters really have a nice flavor - great "seasoning" for so many drinks! Thanks for the comment. Hi Rosa, this really has such a refreshing flavor! Thanks for the comment. Hi veganmiam, doesn't Chartreuse have such an interesting flavor? I totally love it! Thanks for the comment. Hi Malou, I really like that big ice cube too! Hope you're having a terrific time in the Philippines! Thanks for the comment. Hi Greg, many cocktails could use some work, but I agree this isn't one of them. Just get the gin/Chartreuse ratio right for your taste, and you're in business! Your new books sounds like fun - I should check it out. Thanks for the comment. Hi Louise, it's still pretty hot here, so the Tiki torches are still out! Chartreuse is an interesting ingredient. It's great in this drink, and in the Last Word (among others). Worth trying. Thanks for the comment. John, if I come visit you some day, would you please make me one of your stunning cocktails!? Your photographs are simply breathtaking. Hi Lizzy, I'd be delighted to mix you a cocktail! Come visit. ;-) Thanks for your kind words, and comment. This cocktail looks awesome! I have actually never had a cocktail. Shocking, I know! Hi Cathleen, you should try a cocktail one of these days - they can be delish! Thanks for the comment. So refreshing! Would love to sip away! This is such a beautiful drink, John! My husband uses that square ice cube maker for his whiskey. I sometimes use that for my iced tea. :D Very elegant shot of drink! Beautiful cocktail. I have never tried chartreuse. Interesting... Have you ever been to an ice bar? You know the kind where everything is made out of ice and even the glasses are out of ice and you were fur coats? They certainly need to add your Alaskan cocktail to their menu. Hi Nami, I love those big, square cubes! Loads of fun, and perfect for whiskey (or iced tea!). Thanks for the comment. Hi Bam, I think Chartreuse is really interesting stuff, but might not be a bad idea to order a drink with it when out sometime - it's not everyone's flavor. I know the sort of ice bar you mean, but have never been to one - sounds like so much fun! Thanks for the comment. Hi Asmita, it's a fun drink to sip! So good. ;-) Thanks for the comment. Londoners are definitely proud of their gin. Such crisp photography, as usual! I always find photographing drinks to be far more difficult in terms of styling... you do it so well. Hi Irina, photographing drinks is a challenge, at least to me: you have light (which means reflection) issues to deal with, then the styling challenge. I usually go for really simple styling so that's a help. Thanks for your kind words, and for commenting. Anything gin and my husband is all over it. I want to come to your house for cocktails. If I bring the appetizers, am I invited? Hi Kristi, of course you're invited! It'll be fun. ;-) And your husband will enjoy this drink - it's quite good. Thanks for the comment. Hi Raymund, that ice is a lot of fun, isn't it? Thanks for your very kind comment. The picture is stunning with cool colors and the ice cube with lemon zest in the background. It' just soo stylish, love it. You have made this drink look so lovely with that ice cube beside the glass. This drink sounds really different. Hi Daniela, doesn't this drink have fun color? Lovely taste, too. Thanks for the kind words, and comment. Hi Suzanne, it is a really nice drink. Not rum, of course, which I know is your cup of tea, but quite nice. Thanks for the comment. Hi Gourmet Getaways, there's no getting around the fact this drink does deliver some alcoholic punch. But it's a wonderfully flavored one! Thanks for the comment. John, that last photo with the melting ice cube and cocktail is just stunning! It is still very hot where we are, so an icy cocktail is incredibly tempting. Thanks for sharing this one! Hi Hannah, I had a lot of fun with that ice cube! It's been hot here too - close to 100F. But over the weekend it's supposed to get cooler, thank goodness. Thanks for the comment. I am pinning this one! Hi Marta, this one is really a winner - worth making. Thanks for the pin, and the comment. Hi Terra, I'm not sure I'd want to live in Alaska, but it's a wonderful place to visit! Drinking this cocktail is the next best thing to being there. ;-) Thanks for the comment.